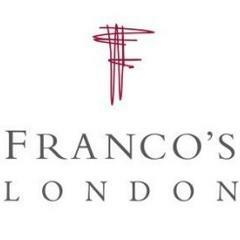 Franco’s first opened in 1946 and is considered by many to be one of the first Italian restaurants in London. The restaurant’s sister restaurant is Wiltons also on Jermyn Street, both of which are owned by the Hambros family.The restaurant compromises of a bar area, main dining room and a basement area which can be used as two Private Dining rooms or additional seating for the restaurant. Franco’s is open all day for breakfast, lunch, afternoon tea and dinner Monday to Saturday.